Hansen 1, Collopy 1 in Heads Up High Roller final table. The suspense is killing us – when Gus Hansen easily despatched Jim Collopy in the first round of the WSOPE Heads Up High Roller final, it seemed as though the bracelet was all but his. Hansen started off strong again in the second match between the two but Collopy’s A-Q outdrew the Dane’s K-K all in before the flop. This pissed off a tired Hansen as it was coming up to 3am; eventually the chips went in the middle with Hansen holding Q-Q and Collopy 9-9. A 9-3-3 flop pretty much ended that one and the players are now one-all. They both wish to play in Day 1b of the WSOPE Main Event today so their last match has been postponed. They are playing for a prize of £288,000 and, of course, a WSOP bracelet. The finalists saw off Andrew Feldman and Ram Vaswani in order to reach this stage of the tournament with a bracelet in sight. 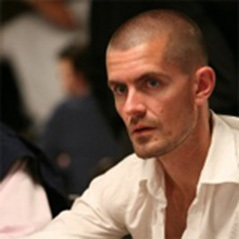 Tags: Poker News, Hansen, 1, , Collopy, 1, in, Heads, Up, High, Roller, final, table.